Of course, the centerpiece of the park is, Stone Mountain, a dome of exposed granite (specifically a quartz diorite to granodiorite) of Devonian age, which has intruded into the gneiss of the Precambrian Alligator Back Formation. The mountain is the best example of a monadnock in massive granite in North Carolina.&nbsp; It rises sharply over 600&nbsp;feet above the surrounding terrain. The mountain, which has an elevation of 2,305&nbsp;feet above sea level, is known for its barren sides and distinctive brown-gray color, and can be seen for miles. The mountain offers some of the best rock climbing in North Carolina, and there&#39;s more than 20 miles of designated trout waters. Take a hike in the park, there&#39;s more than 18 miles of trails. 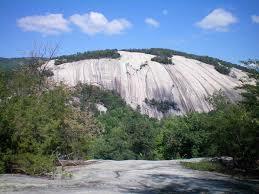 Designated as a National Natural Landmark in 1975, Stone Mountain is bounded on the north by the Blue Ridge Parkway and on the west by the Thurmond Chatham Game Lands. Ashe County NC has many wonderful North Carolina Mountain Communities throughout and is a great place to relocate, retire, or purchase a mountain retreat.&nbsp; Our knowledgeable Ashe County Real Estate Agents are here to help you find Blue Ridge Mountain Real Estate and Large Tracts of NC Mountain Land for Sale today!&nbsp; No matter what type of property you are looking for, A1 Mountain Realty is your source.&nbsp; Check out our listings from our website (www.a1mountainrealty.com) and if you don&#39;t find something you like in our listings of Ashe County Real Estate and Watauga County NC Real Estate then check out the High Country MLS for other properties across the NC Mountains.